NFL scouts might question CB Myron Rolle’s 40 time, or if his hips are fluid enough but they can never question his intelligence. Rolle is a Rhodes Scholar. Today, he announced he would postpone his NFL career and spend 2009 in Oxford England getting a masters degree in medical technology. But there is a lot more to this story than that. Rolle was told by the league’s NFL draft forecast that he would be a top 50 pick. That would mean a cash signing bonus of around 2 million and a 3 year contract worth about 18 million. That isn’t bad, but someone as smart as Rolle can do better. 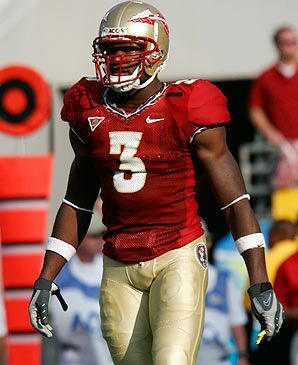 Rolle came to Florida State from the Hun School of Princeton where he maintained a 4.0 grade point. At FSU he graduated in just 2.5 years majoring in exercise science with a focus on pre-med. He is currently finishing up his masters in Public Administration. At the same time, he became an All American corner back for FSU. Sometimes football conflicted with his academic pursuits. His interview for the Rhodes scholarship was the same day as FSU was scheduled to play at Maryland. He went to Coach Bobby Bowden and explained the situation. Bowden did the right thing and told him to go to the interview. Then Coach Bowden got permission from the NCAA to allow Rolle to take a charter flight from Alabama to College Park as soon as the interview was over. He not only made the interview, he won the scholarship and made it back to the game by half time. Not only does Myron Rolle deserve congratulations but so does Coach Bowden. His actions have given his team a real world example of how education and athletics can work together. It also was proof that Coach Bowden ranks education above football. How many coaches really believe that? We wish the very best for Myron Rolle. I am certain he will find a way to get everything he wants for his life.